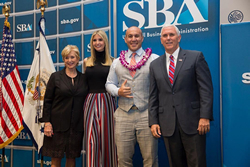 As part of National Small Business Week, Vice President of the United States Mike Pence, SBA Administrator Linda McMahon, and First Daughter and entrepreneur Ivanka Trump recognized this year’s Small Business Persons of the Year and other national award winners at a ceremony and reception at the United States Institute of Peace in Washington, D.C., on Monday, May 1st, 2017. 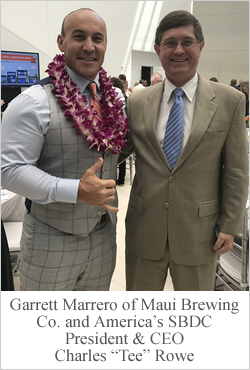 Garrett and Melanie started working with the Hawaii SBDC in 2004, when they were seeking financing for their first project – a small, seven-barrel brewpub launched with the help of SBA financing. Today, Maui Brewing Company is the largest craft beer producer in Hawaii. To learn more about Maui Brewing click here. 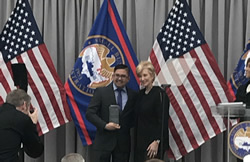 Administrator McMahon also recognized National Small Business Person of the Year runners-up from Kentucky, California and Virginia, as well as winners from each of America’s states and territories. 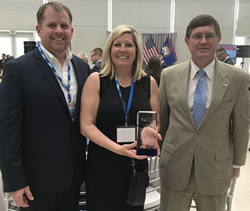 “All of our winners have built very successful businesses through their hard work, innovative ideas and dedication to their employees and communities,” McMahon said. The First Runner-Up for the National Small Business Person of The Year Award was also an SBDC client, from Kentucky. Debra Dudley, President and Co-Founder of Oscarware, Inc. in Bonnieville, KY was acknowledged at the ceremony. Oscarware, Inc., a family-owned manufacturing business, was founded in 1989 by Debra and Reg Dudley. They pioneered the concept of manufacturing outdoor cooking with a disposable “Grill Topper” designed to provide campers a quick, easy and inexpensive way to cook in parks and campgrounds. Since that first product, Oscarware has expanded to 17 outdoor cooking gadgets, all manufactured in Kentucky. Oscarware has grown to 32 employees and distributes products across the United States. It now exports its products to Canada and Europe, with assistance from the SBA STEP exporting program. When Reg Dudley passed away unexpectedly in 2006, Debra took over at the helm of the company. She reached out to the Western Kentucky University SBDC, and since then has received extensive consulting and assistance with marketing, product development, and financial forecasting for the business. 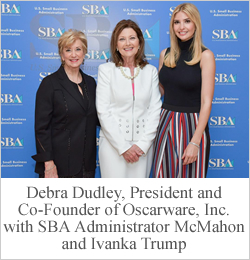 The SBDC also helped Debra develop a strong business plan that enabled the company to obtain several commercial bank loans. This influx of cash was used to become current on two SBA 7(a) loans and to purchase materials and supplies. In the past three years, revenues have rapidly grown and net worth has more than doubled. In 2015, the company’s sales grew a record 50 percent. Debra and Oscarware annually contribute time and money to local and regional charities, civic groups and schools. Check out some more of our event photos and National Small Business Week SBDC Winners & Finalists! This year’s National Small Business Week was incredibly exciting and we were thrilled to be a part of it. Congratulations to all the winners and SBDCs who were involved! Click here to find your local SBDC!